There is one thing about the architecture in Berlin which you probably have noticed already: Berlin is a city which does not have a coherent and characteristic style in architecture. The compelling diversity of this city even finds expression on the level of building styles. From Socialist Classicist Frankfurter Tor over the Gothic town hall to the neo-Renaissance Berlin cathedral – you can find almost everything here. But even in this jungle of different designs, there is one specific building that stands out: the New Synagogue in Mitte. The New Synagogue was designed in an Eastern Moorish style, which is unique in Berlin. Allegedly, it resembles the Alhambra in Granada. 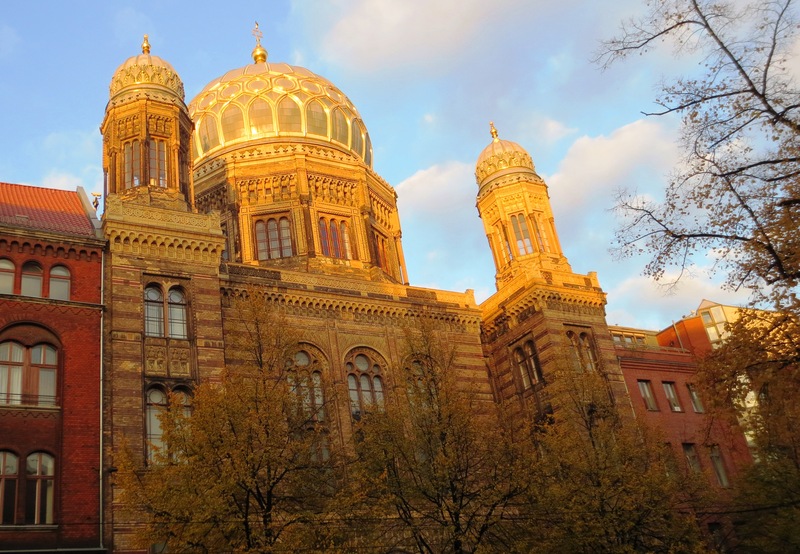 The Synagogue’s beautiful dome along with its golden décor is a defining element of the Berlin skyline. Especially from the Friedrichsbrücke (Friedrich bridge) at Museum Island, you have a stunning view on the Synagogue’s cupola. But of course the New Synagogue is not only significant for its architecture, but represents the Jewish heritage, culture and history in Germany. To know more about the New Synagogue’s past and present, we invite you to listen to our juicy talk below. And then, take a trip to Mitte – go walk this talk!